because I was shirtless and bloated and yucky feeling so I kinda cut that out. Anyways, there's two pieces, they tie together at the sides. i.e. it was just to see if the 'pattern' I made would work. because I want to make a better prettier one. This how to is just telling you the basics. I didn't make it too ruffly, I didn't add lace ar anything, but YOU can. First you're going to want to draw out your pattern. Note: notice the shape of the front piece.. you're going to want the bottom of the piece longer than the top because it'll go around your hips that way. 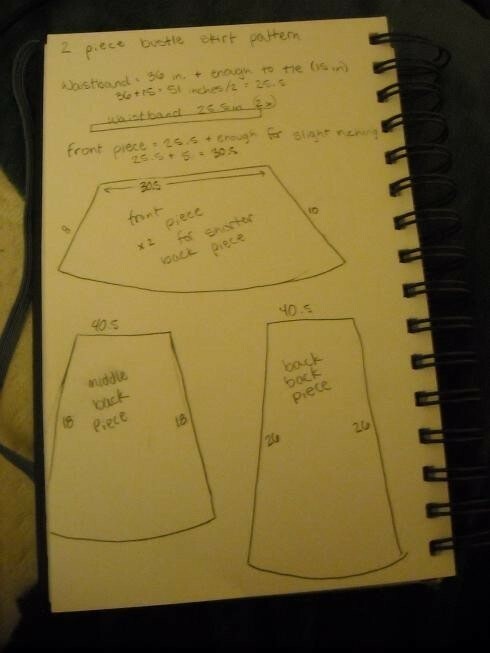 and these measurements will not get you a very ruffly skirt by the way. You should have two waistbands, one for each the back and front. I didn't follow the measurements I have on the paper, I just made sure I had at least seven inches of fabric hanging off each end. In fact, I didn't even cut the waistband until I sewed it on. You need one piece for the front. I cut mine 30.5 inches long, and ten inches wide. I cut two, so that I would use the same size piece as the shortest back piece. You need one piece for the middle back piece. I cut mine at 40.5 inchs long, and 18 inches wide. You need one piece for the longest back piece. I cut mine at 40.5 inches long, and 23 inches wide. You may want to round the corners of the back pieces. 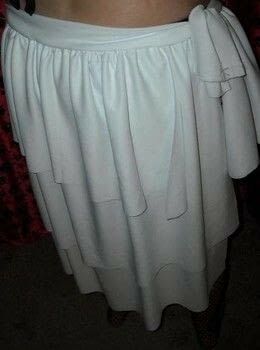 In fact, think ahead about how you want this skirt to look. I'm only giving you the basics, you decorate the way you want. Lace? Ribbon ties? Whatever you want. Place the longest back piece on the bottom. Place the middle back piece on top of the longest one. Place the shortest back piece on top of the middle one. Make sure the top of all the pieces line up. Make sure the shortest piece (if you made it shorter than the rest like I did) is in the middle. Bast all three pieces together along the top. Or do a running stich, DO NOT BACKSTITCH, you need to pull the thread so it ruffles. 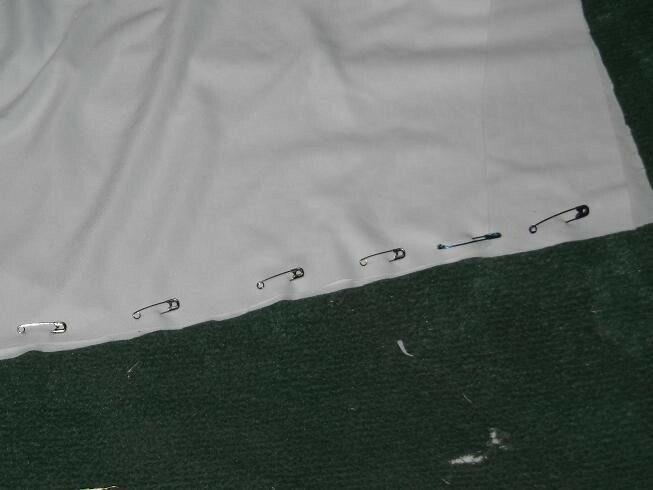 Pull the thread until the fabric is ruffled to half the length of your waist measurment. Now, if you have a cat or dog or some animal who likes to play with whatever you're doing, I would suggest sewing the waistband onto your back piece NOW. You can make the waistband as long as your waist measurement, and then sew ribbons on for the ties, or you could make sure the waistband is long enough to tie to the front piece. It's up to you, THINK AHEAD. Now the front piece. 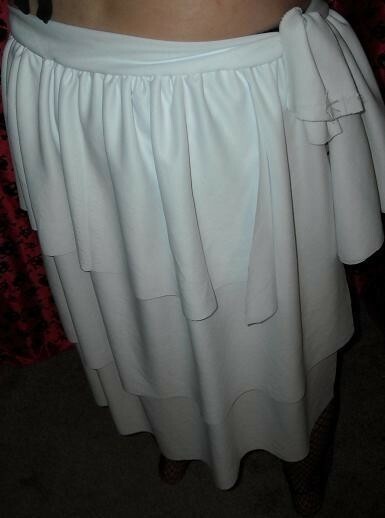 I didn't want mine as ruffly as the back piece, which is why I made the 2 Piece bustle skirt. Baste the edge, and pull the thread until the piece is half your waist measurment. Sew on the waistband to this piece as well, just the way you want it. Now, I didn't do anything more than what I've told you. 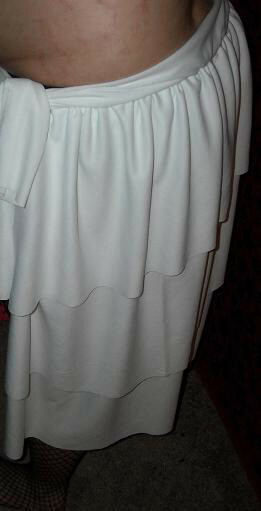 I didn't hem edges, add lace, ribbon, whatever. Like I said before, I pretty much made this just to see if it would work the way I thought it would, so I could give it away and make a better one. Tie on at both sides, and go have a fun night out.